Cool, I am surprise this was not included in the key note speech on Android. Now if they can only fix the bug that allows your "Other apps in your library" section of that page to only show the first 20 pages of apps (I can't get past the letter "H"), that would be fantastic. I would love to have this feature. My list has some archaic apps I know I will never install again. I have two accounts on my android device. I have installed an app using one google account. now the account id deleted. can I remotely delete the same app using the other account? This while article is no longer valid: Google removed this function a long time ago. You can no longer deinstall apps remotely, and any app that you have ever installed shows up now as installed, even if you have had it deinstalled years ago. You're right, I updated the article. Then how to uninstall ? i have a Query Which is out of box, How to get or track the Lost mobile? 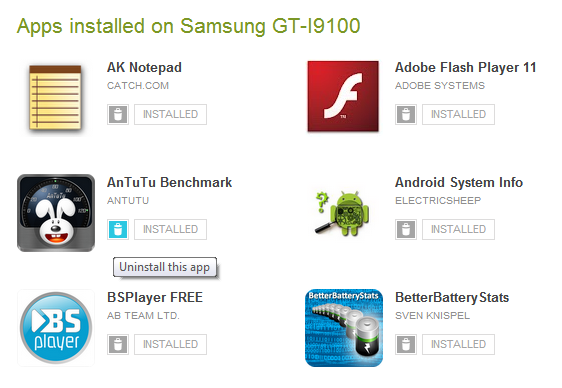 i had GTS5282, in which i havent installed the tracking application? can any one please update me how to get the location of my mobile, whats the SIM currently in it? I am wondering and looking this best mobile website. I got sufficient information from your offeres and soul of heart.